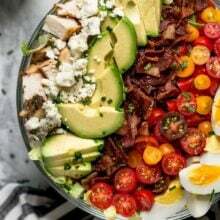 Cobb Salad with chicken, bacon, tomatoes, hard boiled eggs, Avocado, blue cheese, chives, and a simple red wine vinegar dressing. 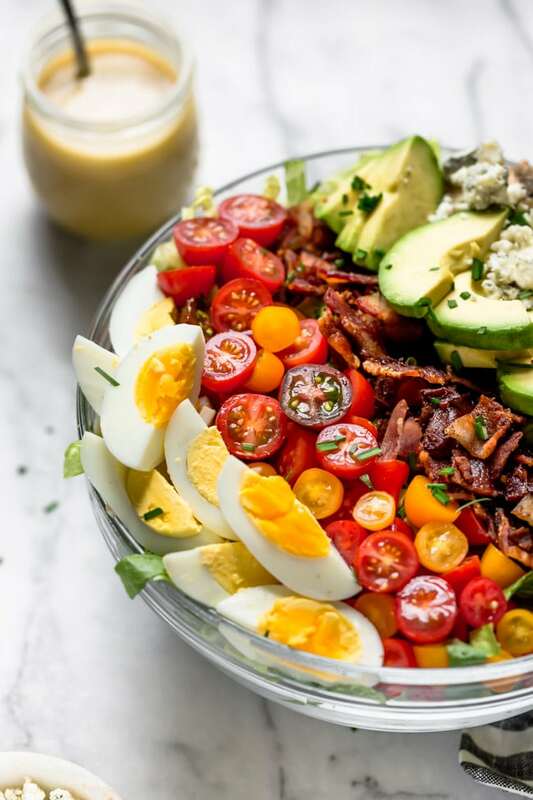 This traditional cobb salad is loaded with goodness and always a favorite! 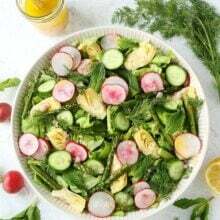 I love making salads because they are pretty, fresh, and delicious. We have been eating salads all summer long and can’t get enough. Josh is usually fine with a salad for dinner because I don’t do boring salads, I always make salads that are loaded with lots of goodies. One of Josh’s favorite salads is a Cobb Salad. When we go out to eat, he will usually order a Cobb Salad if it is on the menu. I decided to surprise Josh with is favorite salad and make him a classic Cobb Salad for dinner at home. He was pleasantly surprised to see his favorite salad on the dinner table. What Is a Cobb Salad? Rumor has it that the Cobb Salad was invented by Hollywood restaurateur Robert Cobb in 1937. Robert was hungry while working at his restaurant, Brown Derby, and created a loaded salad with all of the ingredients he had on hand. This salad is now a popular main-dish American salad that is served at restaurants everywhere. I am not exactly sure if this story is true, but the Cobb salad has been around for a long time and that makes A LOT of people happy, including Josh. This salad is a legend! Greens-Like most salads, you start with greens. The traditional Cobb salad uses a mix of greens: Romaine, iceberg, watercress, and endives. I only used Romaine lettuce because that is what we had, but feel free to use a mix of greens. Chicken-You can use grilled, boiled, or roasted chicken. If you are short on time, use rotisserie chicken from the store! Bacon-I think the bacon is Josh’s favorite part of the salad:) Cook bacon strips until crispy and chop them up into pieces to put on the salad. Hard Boiled Eggs-Cut hard boiled eggs in quarters lengthwise or you can chop them up. Pro tip-use an Instant Pot to make hard boiled eggs. They come out perfect every time! 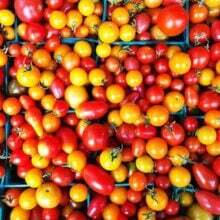 Tomatoes-I like to use grape or cherry tomatoes and cut them in half. You can chop up regular size tomatoes. 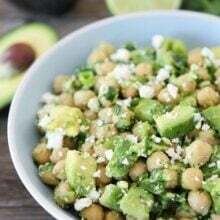 Avocado-Avocado makes any salad better. Make sure you use a ripe avocado. Cut the avocado into sliced or chop it into pieces. Roquefort cheese-Roquefort cheese, which is a sheep milk cheese from the south of France and one of the most popular varieties of blue cheese and the traditional cheese used in a Cobb salad. You can use any variety of blue cheese if you wish and if blue cheese isn’t your thing, feel free to substitute your favorite cheese. Chives-Chopped chives get sprinkled over the salad for a little flavor and pretty garnish. Dressing-The red wine vinaigrette dressing doesn’t take long to whisk up and compliments the salad nicely. The salad has a lot of flavor so you don’t need a lot of dressing. There are a lot of ingredients in this salad, but don’t let that scare you. You can prep most of them in advance. This is a great meal prep salad because you can keep all of the ingredients in the refrigerator until you are ready to assemble. It is also a good salad to take to work, or have ready in the fridge for dinnertime. When you have all of your ingredients ready to go, it is time to put the salad together. You can make one big salad in a large bowl or platter or make individual salads. Put the greens in a bowl or on a platter to form the base of the salad. 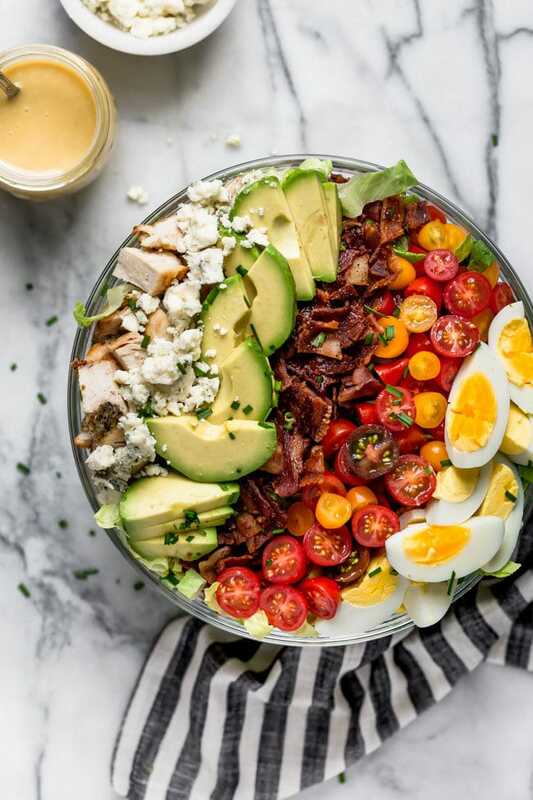 You want to place the chicken, bacon, hard boiled eggs, tomatoes, avocado, and blue cheese in lines to create a decorative salad. Garnish with the chives and drizzle the dressing over the top. 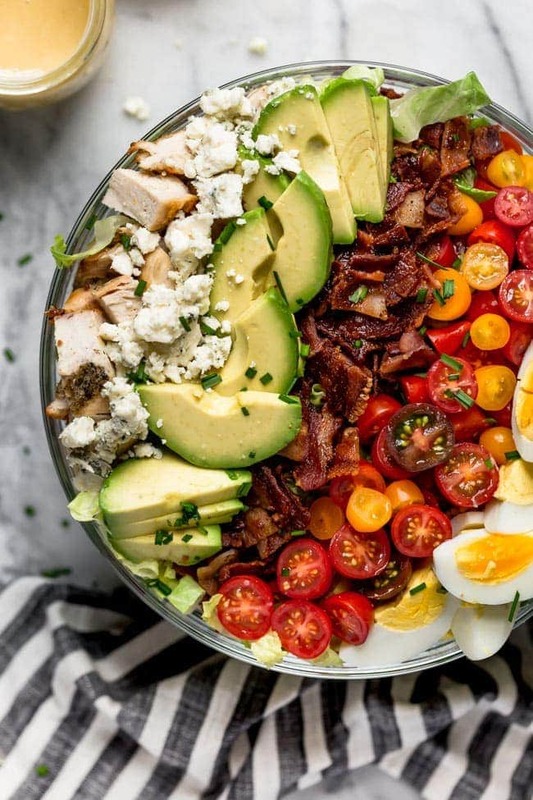 This colorful Cobb Salad is a beauty! The presentation really makes the salad and it doesn’t take long. You can’t go wrong with a classic Cobb Salad! Get the ingredients ready and make a salad for lunch or dinner! You will enjoy every bite. 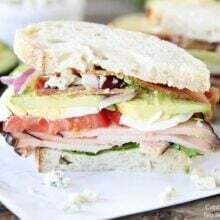 This classic Cobb Salad is great for lunch or dinner! You can prep all of the ingredients in advance which makes this salad great for an easy meal! In a small bowl whisk together the olive oil, vinegar, garlic, honey, mustard, salt, and pepper. Drizzle the dressing over the salad and serve immediately. This salad looks amazing! I need it in my life asap! 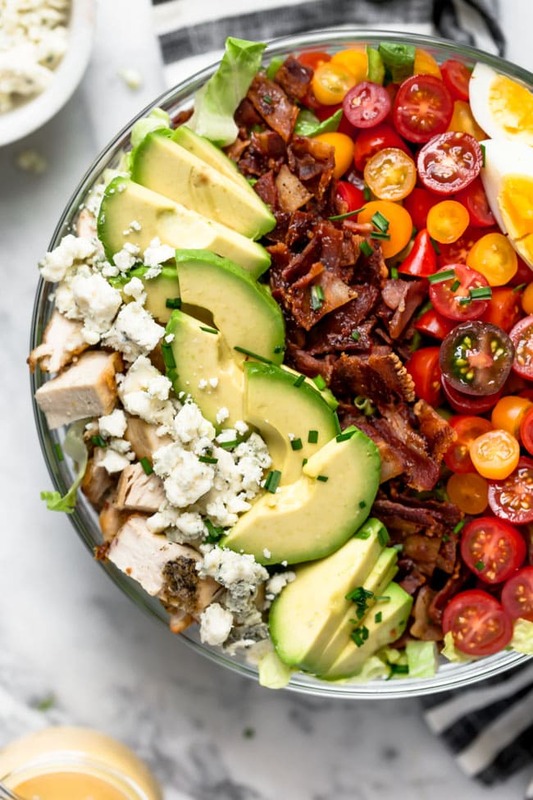 This Cobb Salad is a stunner! Wow…This is amazing recipe, promise i really like it. I cant wait to make like this recipe also… 5 star for this. Thanks for sharing. I love it. This recipe is so easy and so good! I used Applewood smoked bacon, which was the only thing I had to cook. I bought chicken and boiled eggs from the deli. It’s a beautiful presentation, also. Loved this. So so loved this. Used a Costco Chicken to make things easier. Great dinner! Great recipe this looks so tasty and heartfelt!! This sounds amazing! I want to dive into my screen!